Burj Al Arab is one of the most luxurious, and with height of 321m, it is fourth tallest hotel in the world. It is the only hotel in the world that is said to have seven stars. The building itself is one of the most photographed monuments in the world and is recognized as the symbol of Dubai. The shape of the building is designed to mimic the sail of a dhow � traditional sailing vessel. The building stands on artificial island and it is connected to the mainland by a private curving bridge. The building stands on artificial island 280m offshore, connected to the mainland by a private bridge. The island and the bridge, together with a part of the beach on the mainland right across the island, which also belongs to the hotel, are not publicly accessible. This means that, unless you are a guest, it is not possible to take a look around the hotel lobby, or even approach the building close enough to take	a good look at it. A disappointing fact for many visitors. So, if you�re not staying at the hotel, you need a restaurant reservation to get in, and it is not as expensive as it may sound. 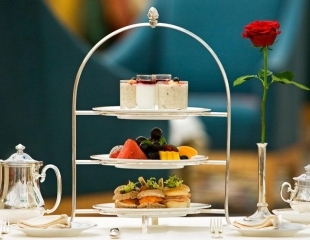 Many local agencies offer packages that include a meal in one of the Burj Al Arab restaurants and transfer from your hotel, and these can easily be found online or on your hotel reception. The less expensive and more flexible alternative is to make a reservation yourself. 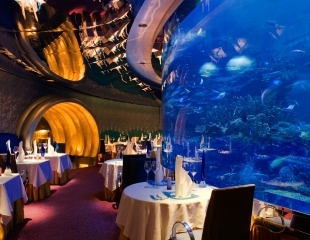 Advance reservation is essential for all of the Burj Al Arab restaurants. It can be made by phone or e-mail, but be prepared to be asked for credit card number, because a no-show fee is charged, and to write down a pass code you will need to get past security. Also, be aware of the dress code that is smart casual or semi-formal depending on the chosen restaurant and time. Whatever restaurant you choose, once you are inside the complex, you are free to take a look around the lobby and take photos inside and outside of the hotel, but only Al Muntaha Restaurant and Skyview Bar guests can ride the panoramic elevator and enjoy the spectacular view from 200 meters above sea level. However, if you also visit the nearby, 830m tall, Burj Khalifa, the view from Burj al Arab will not seam that spectacular any more. Together with exquisite dining and fancy cocktails, Burj Al Arab restaurants and bars offer a rare possibility to enter Burj Al Arab. Since Burj Al Arab in not accessible to the public, except for hotel and restaurant guests, the only way to take a tour of this, most famous Dubai sight is to book a room or a restaurant table. There are seven restaurants and two bars in the hotel complex. 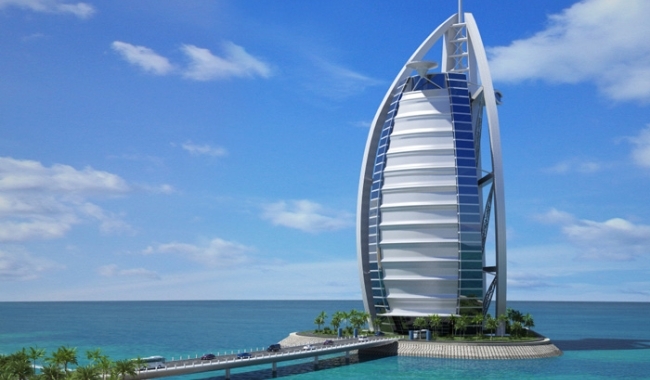 Read more detailed instructions in the Burj Al Arab Tour Guide above. There are three restaurants to choose from, with different style of food and different ambient. 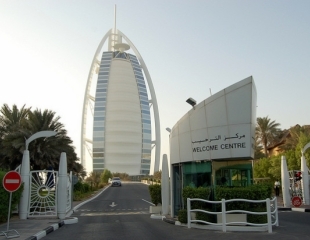 The closest public space to the Burj Al Arab hotel is at the complex entrance on the mainland, over 300m away from the hotel. There are usually some 10-15 tourists moving around, trying to take a photo, at the same time evading the cars coming in and out of the hotel. The disk atop the Burj Al Arab hotel is a 211m high helipad. 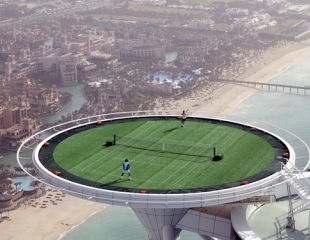 On February 22, 2005, Andre Agassi and Roger Federer played a match on the helipad, that was turned into a tennis court for this occasion. It was a great promotion both for the Burj Al Arab hotel and for the Dubai Duty Free Men�s Open championship.